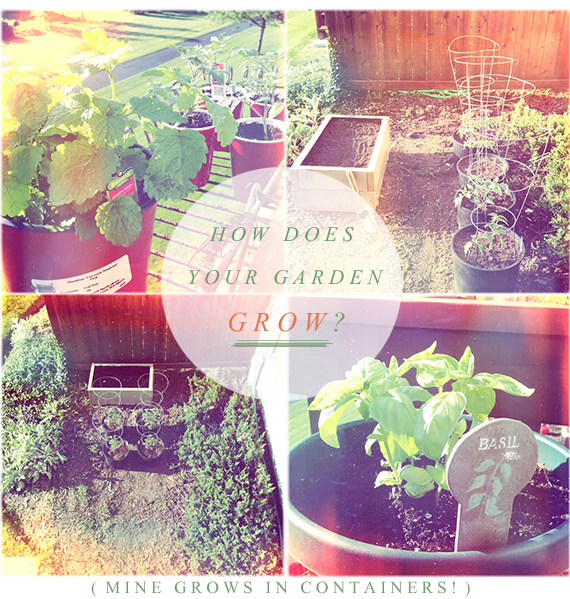 Bubby and Bean ::: Living Creatively: How Does Your (Container) Garden Grow? 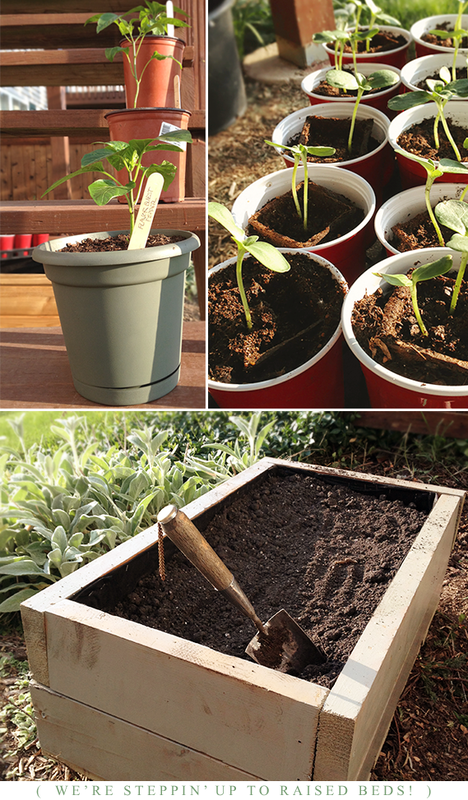 How Does Your (Container) Garden Grow? 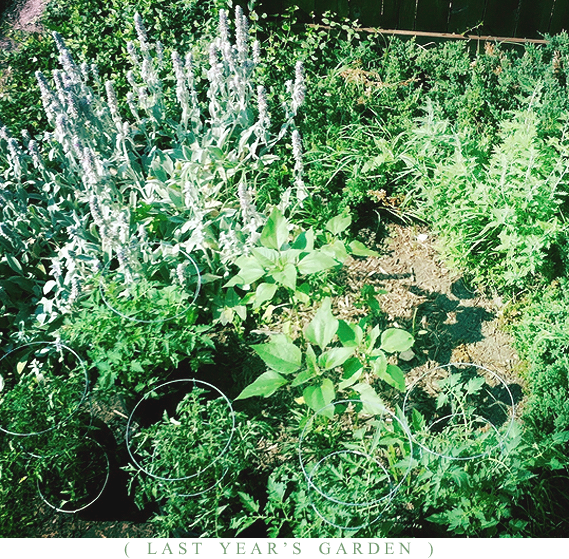 "Robbie and I randomly bought a little $1 organic basil seed kit on a whim while out running errands... We didn't think much of it, as neither of us had ever really possessed the desire to garden before (nor a yard in which to plant even if we had). But when those seeds turned to sprouts and poked their little bits of green goodness through that black soil, we were suddenly urban farmers with glowing green thumbs, ready to grow all sorts of food and lovely-to-look-at plants on our deck/terrace for summer." It's true. Something about seeing that basil seed sprout unleashed a hidden garden obsession within both of us, and we discovered an awesome new hobby in something that we'd never before imagined would interest us. We ended up growing that tiny basil seed into a hearty plant that provided us with endless pesto and fresh basil sandwiches all summer long. We also grew red and yellow tomatoes, sunflowers, and a bunch of ornamental plants. All in containers. 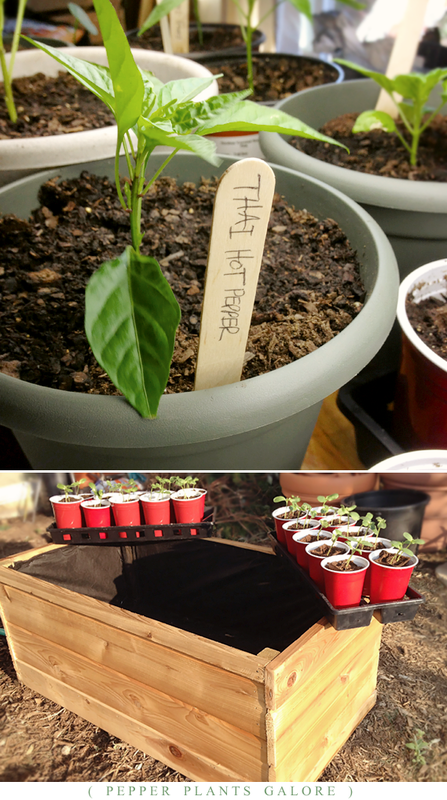 The best part (because we had no idea what we were doing) was that we were forced to do a lot of research on container gardening, which allowed us to be prepared to create a bigger and better garden this time around. In all fairness, it is Robbie who has done most of the work so far this year. The band spent the first four months of the year on the road almost nonstop, so with the exception of weekend festivals, they're home quite a lot for the rest of the spring and beginning of summer. 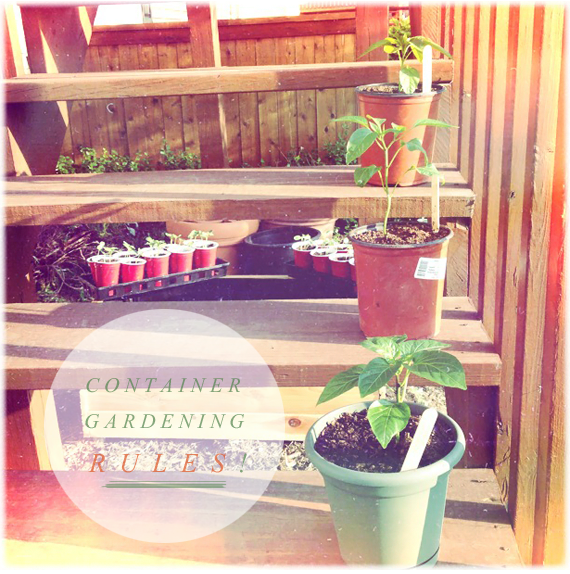 Robbie has been spending a lot of his time pursuing our container gardening addiction, and I have to say that I'm really impressed with everything he's been accomplishing. He's been reading, learning, building, clearing, planting, and DIY-ing. So far he's built two raised beds, and even has a little indoor growing area set up in the basement for the seedlings. He's planted heirloom tomatoes, basil, thyme, cumin, rosemary, oregano, spearmint, peppermint, parsley, lettuce, daisies, and sunflowers. Our friends John and Amanda also gave us a ton of baby pepper plants, which I'll admit is ridiculously exciting for us (we love us some hot peppers). Yep, that's what gardening does to you, it's addicting. I love to play in the dirt! Last summer my fiance attempted to grow some Jalapenos in one of those hanging vegetable planters, and it didn't fare too well unfortunately! I'll have to tell him about this container gardening idea. oh this is fabulous! i would love to do this but whenever i even have a few herbs outside the squirrels eat them...a bit weird i think - crazy squirrels. good luck! As soon as I move and get my own place I am going to try this. I hate buying "fresh" from the grocery store. Your garden looks fantastic btw. That's cool! Your garden is flourishing! I don't have a green thumb yet, but I'm getting there. I love container gardening! Fantastic job! I remember you posting about this last year, my how you've grown haha!! :-D it's so cool you guys are making such great use of your space and I hope you'll post more pictures as they grow!! Great job! Love your garden. A very productive hobby. The best part is the rewards of deliciously vine-ripened veggies straight from the garden. I have always wanted to get into gardening, but it just wouldn't be fair to the poor plants, I don't have the time! Awesome! It almost makes me want to go and dig in the dirt. Love home grown tomatoes and peppers. this is so cool. i don't have a yard either, but i want to try this. i'm a pepper lover too. I spend last weekend pottering around our little garden, even my little girl loves to get stick in. We have recently become green thumbs ourselves, it is so nice how rewarding it is to eat something you have grown yourself. I never thought I would be like this, but it is slightly addictive. I go to the garden store thinking, now what here is edible. Definitely bookmarking this post for later! My boyfriend & I started doing some container gardening when we were living in the city, but now that we're living with my parents we don't have the room. Luckily we're moving into a slightly bigger place, and we're going to start up our garden again!